Arts and craft design ideas for kids and teens so they can give mom a gift they've made themselves... Decorative, stylish gifts that can be made with new craft materials. Wooden bookmarks, to make sure you don't lose your place in your latest bedtime reading or cookbook recipe ... This easy and imaginative design is based around model shapes from L'Atelier bois (The wood workshop). Colorful coasters are a practical gift that will add a touch of class to mom's table! 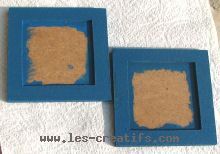 Start by painting the coasters with the acrylic paint. Once the paint has dried, get an adult to spray on the varnish that will protect the paint. 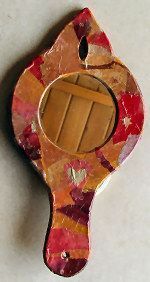 Once the varnish is dry, the child may apply glue to part of the coaster and start putting the mini mosaic tiles into place. A teenager may use mosaic tiles that are twice as small (0.2 inches) to create a more elegant design (photo on right, creating a matt/clear zesty, candy color effect). A handful of colored Hama beads and a pegboard: let the craftmaking begin! Simply place the beads on a pegboard, either in a random pattern (and at the age of 2, that's not always easy) or in a pattern. 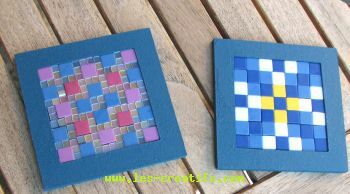 It's possible just to create the outline of the pattern but the design will be more fragile in this case. Now, it's the adults turn to get down to work by placing a sheet of wax/parchment paper onto the bead-covered pegboard and running a hot iron over it: the plastic beads will melt slightly and fuse together. Once the beads on one side have fused together, turn over the design to remove it from the pegboard (be careful, the plastic will still be quite hot) and put the wax/parchment paper back onto the beads to iron the other side of the bead design. Once it's cooled down, the design is pretty solid.